Inspirational and Provocative! 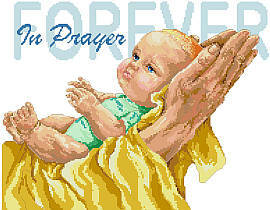 A beautiful rendering of baby and parent inspiring all to pray without ceasing. This heart-warming design is worked in Counted Cross-Stitch. Contents: Stitch Count 192w X 150h, finished size on 14-ct 13-5/8" X 10-5/8"